“Feeling gratitude and not expressing it is like wrapping a present and not giving it.” William Arthur Ward, author. I’ve always been an ambitious person. It’s a positive quality in many ways, but it has a dark side. The drive to do more and to be more can make us forget the sheer wonder of what we already are and already have. There is a Buddhist proverb that goes like this: “Enough is a feast.” How true. The antidote to the dark side of ambition is gratitude, I have learned. 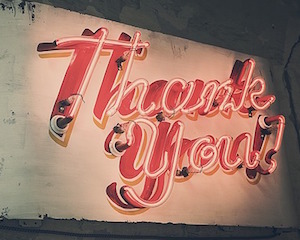 Gratitude both felt and expressed – because without expressing it, we miss half its value, as William Arthur Ward says. I’ve spend so much time with leaders who understand the future, who lead with vision, whose drive helps them to grow as people, and whose motivation is to serve their tribe. I call you the “future makers.” My thanks then to you, my subscribers, my clients and my suppliers; to those of you who have come to Blog Clinic this year; to my family, my friends and supporters; and especially to my daughter, Audrey. Thanks falls short. Thanks to the leaders and members of the Thought Leaders Business School, The Slow School of Business and Hub Melbourne; to my subeditor, Jac McRae; my mentor, Paul Worth; and my coach, Tess Bartlett. You are all dedicated to making a new future for all of us. Author, philosopher and healer, Louise Hay, has a delightfully succinct way with words. Her advice is this: Be. Do. Have. How easily ambition leads us to get this the wrong way around: to want to have and to do before we become the person we want to be. You, the future makers, help me to see the power in first being the person I want to be, which in turn shapes what I do. Then, I can let the “have” take care of itself. Will apartment living ever be preferred by families? Is your content bringing in the big bucks?